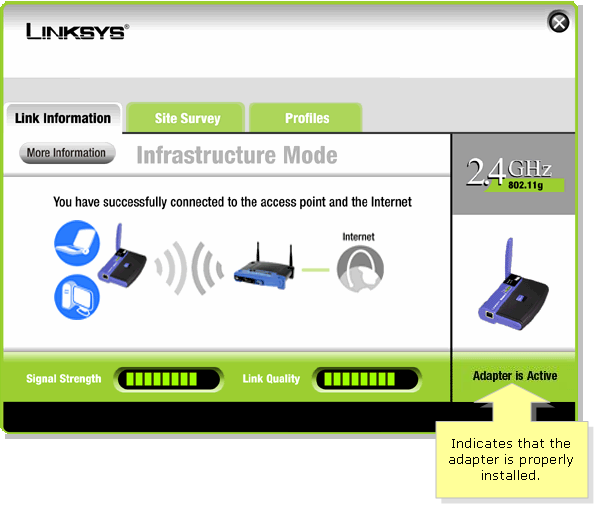 The Linksys Wireless Network Monitor is a software used by the Linksys Wireless Adapter to connect to the network. This can also be used to check if your wireless adapter is properly installed in the computer. NOTE: If the Linksys Wireless Network Monitor is not installed on your computer, you can check if the adapter is properly installed through the Device Manager. For instructions, click here. Double-click the Wireless Network Monitor icon at the bottom right corner of your screen. On the Wireless Network Monitor, check the bottom right corner of the program. It should indicate Adapter is Active. NOTE: If the Wireless Network Monitor indicates that the Adapter is Inactive, it can be that the adapter is not working properly. To resolve this issue, click here.